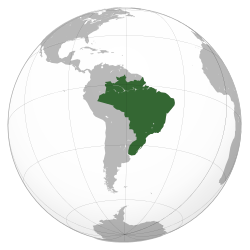 The Empire of Brazil was a parliamentary democratic constitutional monarchy of the nineteenth century that covered the areas of modern Brazil and Uruguay. Brazil was originally a colony of the Portuguese Empire but became its center when the Prince Regent João VI fled the French invasion of Portugal in 1808. When João returned to Portugal he left his son Pedro as regent of the autonomous Kingdom of Brazil. On 7 September 1822, Pedro declared Brazil to be an independent Empire and was acclaimed by the people as emperor. However, he abdicated in 1831 in favour of his young son Pedro II whose reign saw three international wars and decades of economic prosperity and political stability. Pedro I, Pedro II and the entire imperial family of Brazil wanted the abolition of slavery, and on 13 May 1888 the imperial princess regent, Isabel de Bragança and Bourbon signed the Golden Law on behalf of her father, ending slavery in Brazil. By that time, Brazil had been the last major nation to have slavery. Former plantation owners, dissatisfied with the abolition of slavery, joined the republican movement led by Deodoro da Fonseca, an elderly Marshal, to carry out a Coup d'etat and install a republic which became Brazil's first dictatorship on November 15, 1889. The imperial family was exiled and the Republican government persecuted, tortured and killed all those who opposed the regime. This page was last changed on 9 January 2019, at 00:33.